Most people, especially those that love horse racing sports, know something about dressage. 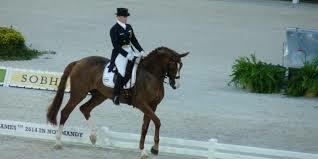 Dressage is a sporting event where a horse performs intricate moves. It is worth noting, that every time you train a horse to carry you and respond to subtle instructions, constitutes as dressage. ng against one’s self. Improving your score is key to becoming a dominant force in the game. Dressage training requires serious effort. You need to work on making your horse more flexible and responsive. Taking a horse for dressage without adequate preparation could cause sore muscles and a reluctant attitude. Thus, it is crucial to train or help your horse understand these moves. Have sufficient time to work on each element of the dressage test. This is critical, as it helps the horse’s muscles adjust to moving differently. For the test, it is also imperative to have the horse spotlessly groomed. Besides just working on the horse’s stamina, the rider is also expected to prepare accordingly. For starters, it is always advisable to work with a coach, which is a lot easier than working alone. A good coach will help you learn how to cue your horse accurately. You will also find it a lot easier to execute each move with intent and precision. For the test, you need to be dressed in the right clothing. The proper attire for dressage test is known the English Habit. You need a helmet, a stock tie, a dressing coat, gloves, breeches, and a pair of boots. There are many challenges in any dressage test. The rider is expected to ride at different gaits, with some variations in each stride. For basic levels, someone on the sidelines might call out the dressage for you. Advanced levels make it a mandatory requirement to memorise each movement. The rider is prompted by a bell or a whistle to get into the ring. From there, one is expected to halt and salute the judges, before they start riding as described by the test. After you complete the test, you are supposed to stop and greet the judges once more on your way out of the ring. Up to three judges evaluate your performance on the dressage. Some critical elements assessed by the judges during the dressage test include how well you ride, obedience, suppleness, accuracy, and attitude. As a reminder, harmony does not occur overnight. Each element of the dressage test must be practised and tested. This requires the horse and rider to break out of their comfort zone. The horse should be attentive and responsive to the rider. The rider too should also work on his balance. Success is only achieved when the horse and the rider are in harmony.